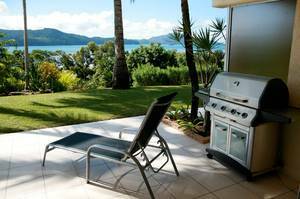 New Deal Out for Hamilton Island! Take $50 off a night in May and June! That is $280 a night for beach front! All our accommodation comes with a personal meet and greet service when you arrive on the island and a complimentary golf buggy included in the prices. Families coming to stay? We have your travel cot and high chair here already. 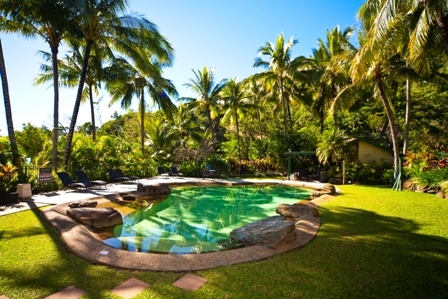 Casuarina 13 is our only 4 bedroom 2 bathroom renovated Villa. 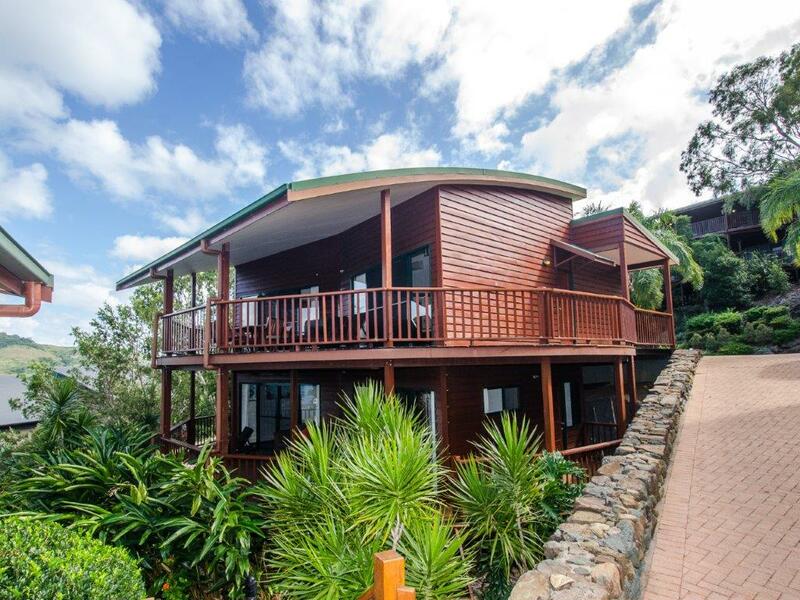 It has 2 floors spectacular views, large entertaining balcony and a chill out balcony, gorgeous bathrooms and can sleep a total of 10 people. Great for 2 families or a group of friends. 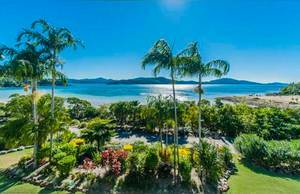 Casuarina 18 is a gorgeous updated Villa with new furnishings has 3 bedroom 2 bathroom and looks over the passage across to Hamilton Island Golf Course on Dent Island. This 2 storey villa gives you great views and a sea breeze, or simply close yourself in to enjoy air conditioned comfort. Sleeps 8 people. Rates as low as $370 per night! Frangipani 5 is currently undergoing a renovation. It has 2 bedrooms and 2 bathrooms. 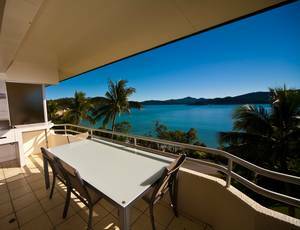 The apartment is on the ground floor of the Frangipani Lodge with simply stunning views out to the islands and reef. It sleeps 5 people. A king in the master bedroom and a queen and single in the second bedroom. Spacious for everyone. Fully equipped kitchen and full size fridge/freezer. Perfect for an afternoon drink and your kids can play on your patch of lawn. 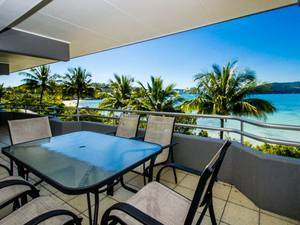 Lagoon 202 - Modern 2 bedroom and 2 bathroom delux apartment with stunning views from this top level apartment. This apartment sleeps 5 people in bed with a king bed in the master bedroom and a queen and single in the second bedroom. Have more family and friends coming. Book Lagoon 201 with us and have side by side apartments. Rates as low as $340 per night! Casuarina 1 is a 3 bedroom, 2 bathroom free standing villa situated up and around the corner from Front Street on the Marina. Upstairs is the main open plan living area, large kitchen and breakfast bar, dining suite and lounge that all opens up to the outdoor entertaining area with BBQ and outdoor setting. It sleeps 6 people. Frangipani 208 is a comfortable 2 bedroom 2 bathroom apartment on the top floor of Frangipani Lodge overlooking catseye beach. It sleeps a total of 6 people. The master bedroom has a luxurious big king mattress that has you waking up with stunning views. The second bedroom has a queen bed and a single bed. One bathroom has been fully renovated and we are waiting for the second bathroom and kitchen to have their makeover. Being an end apartment it has a big window in the second bedroom to let in natural light. Rates as low as $280 per night! Lagoon 201 comfortable and spacious, has 2 bedrooms and 2 renovated bathrooms. 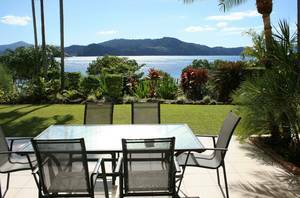 A great apartment to enjoy the view of the stunning crystal clear waters. The apartment sleeps a total of 5 guests. It has a king bed in the master bedroom and either 2 singles or a king in the second bedroom. Being an end apartment it has a big window in the second bedroom to let in the afternoon sun. Rates as low as $310 per night! Lagoon 006 is a great 2 bedroom, 2 bathroom ground floor apartment for a big family. It has a gorgeous open plan living area so from the kitchen you look out past the dining and lounge area to the outdoor enteratining area and lawn. It sleeps a total of 7 people. It has a king bed in the master bedroom and a queen bed and a single bed in the second bedroom. 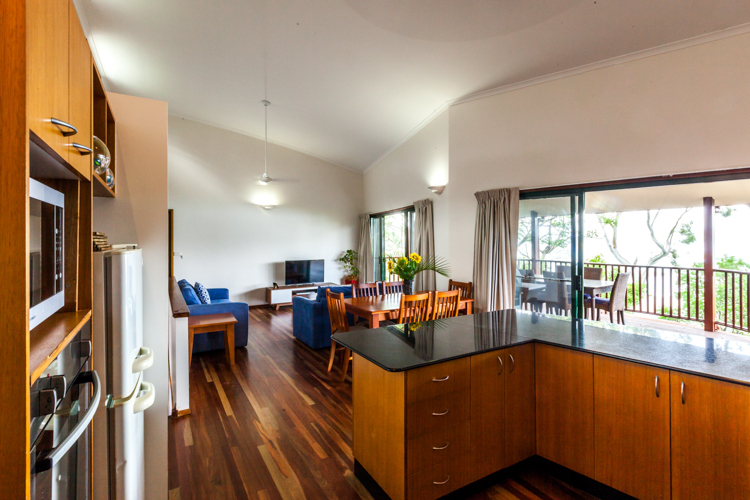 Lagoon 005 perfect for a family friendly holiday with 2 bedrooms and 2 bathrooms on the ground floor of Lagoon Lodge. Open plan living with the kitchen that has an island bench and large gas cook top. The kitchen looks over the dining and lounge out to the outdoor entertaining area and lawn. The master bedroom has a king bed and the second bedroom has queen and single bed. The apartment can sleep 6 people. Lagoon 003 It's a family friendly ground floor 2 bedroom 2 bathroom apartment. The master bedroom has a king bed while the 2nd bedroom has a queen and single bed. The apartment has open plan living so you can see out to the kids playing on the lawn or have friends round for a BBQ. 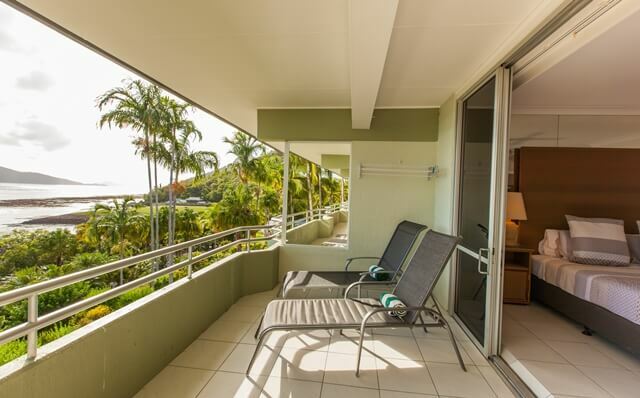 Lagoon 206 is our top floor 2 bedroom 2 bathroom apartment that over looks the beach and turquiose waters. 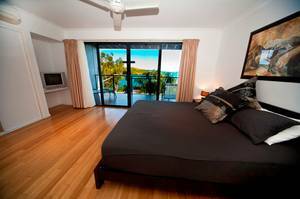 AS SEEN ON AUSTRALIA BEST HOMES..One of the only beachside apartments with a full size bath to melt into. The apartment sleeps a total of 6 guests. It has a king bed in the master bedroom and a queen and single bed in the second bedroom. Shorelines 2 is a fresh split level 2 bedroom apartment. Timber floors throughout and a open plan kitchen and dining area. Downstairs is the master bedroom with a view from bed and ensuite with spa bath. It sleeps 6 people with a king bed in the master bedroom and a king or 2 singles in the second bedroom. 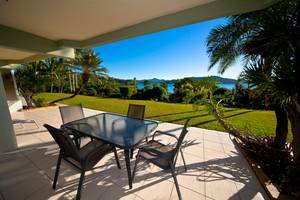 Frangipani 204 is a unique 3 bedroom 3 bathroom apartment that comes with 2 golf buggies. 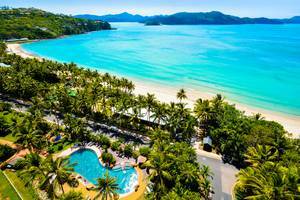 Its on the beachside and looks out over the pristine waters. 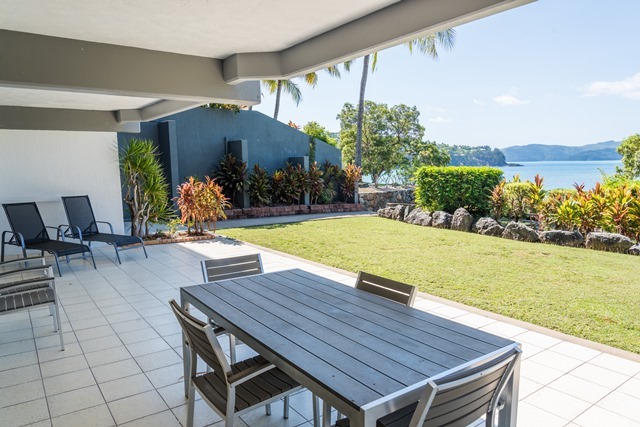 There's only 3 of these 3 bedroom gems on this side of the island, you have to get in quick to get this gem. 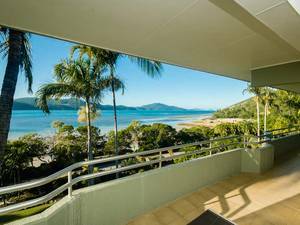 Whitsunday East 1306 is a top floor 1 bedroom apartment with spectacular views out to the Great Barrier Reef. This gorgeous spot can only accommodate 2 adults only. Extra costs apply for extra guests not using beds already provided. Call us now on +61 07 4946 5390 for more details and bookings. All our accommodation comes with airport or marina transfers and a buggy all included in the price!